It will be difficult to get one, though. 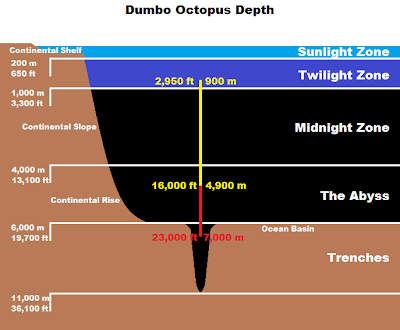 Dumbo Octopuses live in the deep sea, keeping just above the very bottom. 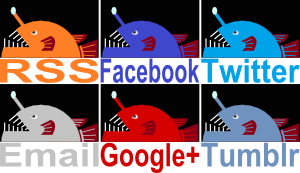 Like the little elephant, they also have a range of choices when it comes to getting around. Their soft, semi-gelatinous bodies allow them to drift peacefully at depth. Flapping their Dumbo ears gets them moving with peculiar grace and ease, which is probably good for conserving energy and is the most commonly observed mode of transport. The webbing between their tentacles can be used for a sudden thrust, perhaps to escape predators, or for a more relaxed journey. They can also do the more ordinary octopus movements, crawling around on their tentacles and using jet propulsion with a simple squirt of water. Dumbo Octopus eat food from the sea floor or above it, like worms, bivalve molluscs and various crustaceans. Their tentacles have just one row of suckers and two rows of fleshy spikes called cirri. These are thought to create a current to usher their meals toward the mouth. Most molluscs have a radula, a sort of hard, tough tongue with teeth on it, used for feeding. In Dumbo Octopuses it's reduced or absent entirely, meaning they can't rip and tear their prey and so they swallow it whole instead. There are currently 14 known species but there used to be 20. It looks like they reach about 20 or 30 centimetres (7.9-12 inches) in length. It seems they are found at depths between 900 and 4,900 metres (2,950-16,000 feet), but it looks like one Dumbo was found at the extraordinary depth of 7,000 metres (23,000 feet), which is quite amazing. This is clearly the deepest any octopus has ever been found, so far. MBARI says they found them at the much more modest depth of 300 to 400 metres (1,000-1,300 feet). While Dumbo Octopus are named after their weird ear flaps, they aren't the only octopus with weird ear flaps. 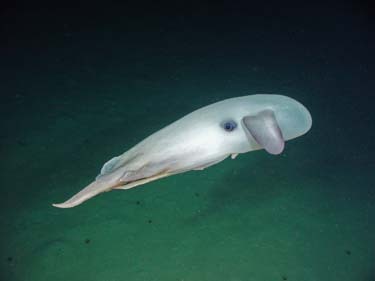 The Dumbos belong to the genus Grimpoteuthis, but there are a couple more closely related genera of similar looking octopus, which is where those 6 missing Dumbos went. I guess that's what happens when you're talking about a strange, deep sea animal who's habits are largely unknown. 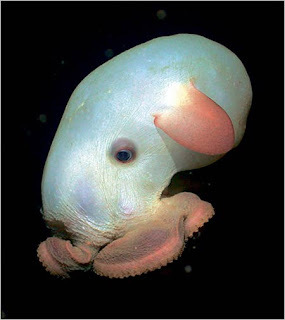 Perhaps I will one day have to write about the Dumbo Octopus all over again. Can't wait! Check out some more videos of the Dumbo Octopus. Yeh, they are strangely cute. I think it looks like they have cow's eyes or something. Glad you enjoyed the post, thanks for coming! In the top photo it looks like the octopus is wearing little boots and walking around. Pretty darned funny! Haha, yeh! It looks like one of the Mr. Men. cool! i loved to learn 'bout them. I'm glad you enjoyed it! They really are wonderful animals! can't you say something that not one likes~!